I get asked a lot of questions about archaeology in an average year of filming, lecturing, teaching and visiting a wide variety of places, but one of the most common is ‘How can I get on a dig?’ It is one of the easiest questions to answer – infinitely preferable to the one I really hate, which is ‘What’s your favourite find?’ (I mean, how on earth could I choose? – the most significant finds are usually the least prepossessing, the significance comes from the context as much as from the object, and anyway how on earth do you judge between very different things from very different periods?). So it is a relief to be asked about finding digs, because the answer is so easy – I simply recommend this Handbook (and the website linked to it). I say that these include digs of any period, and in any part of the country, on almost any terms – ranging from paying for intensive archaeological training to working unpaid in return for free accommodation, food and even beer! There is a lot going on in the way of digs open to volunteers in Britain, but without this Handbook, it really would be very difficult for anyone lacking a contact in the archaeological profession, (or the skills of a private detective) to find out about any digs, let alone the full range of different excavations available that enable choices to be made. That is important, because anyone is likely to enjoy a dig more if they have selected it specially, rather than simply because it was the only one they could find. However, it is not the case that you will not enjoy a dig simply because it was the only one you could get on. When I was a teenager back in the 1980s, I found it impossible to find anywhere near my home in East Anglia which would accept me as a completely inexperienced archaeological ingÃ©nue. I had no source of information like this Handbook, and so my first experience of ‘real’ archaeology came, by chance, as a result of a school trip to Hadrian’s Wall. Slightly embarrassingly, it was not me but my Ancient History teacher who noticed the small sign propped up on the desk of the shop at Vindolanda museum (I think I must have been too busy trying to decide whether to buy a pen or a pencil sharpener to go with my postcards). 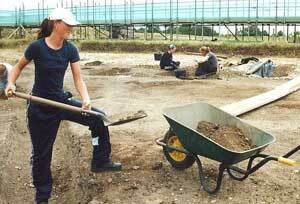 When she pointed out to me that it was asking for volunteers to help with excavations that summer, I was initially sceptical that someone like me would be what they had in mind, but she persuaded me to write and ask – and a few weeks later I was amazed to be accepted. It was to be the first step in my archaeological career. That said, I am not sure that my contribution to the excavations in the month I spent there was particularly remarkable. I remember that the first task I was given was cleaning across the floor of one of the smaller rooms in one of the smaller houses in the vicus, and I naively spent the first couple of hours happily trying to get all the dirt out from between the paving stones, until I was kindly informed that this was neither necessary or desirable. But as the days and weeks passed, I was amazed how rapidly it was possible to learn and to progress to working independently – and proudly – on my ‘own’ bit of the site. It was appealingly novel to be treated as a young adult rather than a schoolgirl, and very enjoyable to feel part of an excavation team which was as friendly as it was entertaining; its members ranging from professional archaeologists such as the directors, to artists and folk singers who had come to the excavation via the Manpower Services Commission, and a smattering of students. It was a hugely formative experience, which transformed for me the aim of being an archaeologist, from a long cherished but rather vague childhood dream, into a realistic, achievable career goal. I must say that I am very pleased to see that Vindolanda is included in this year’s Handbook – as much for sentimental reasons as because it’s a crucial site for the understanding of Roman Britain! Although, in my opinion, it is pretty unwise to start an archaeological degree without having been on a dig, you do not, of course, have to want to be an archaeologist to want to go on a dig. If my experience of those who approach me is anything to go by, a huge range of different types of people, from five to five score years old, from wannabe professionals to third age hobbyists, would love to try digging. And it is certainly something that can suit anyone and everyone. Well, except perhaps the few who hope it might be their passport into a career in television – this is just about the only really bad reason to want to go on a dig. Firstly, of course, because anyone who goes on a dig should do it because they want to go on a dig, not because they want to do something else. Secondly, because people with that idea tend to be attracted by the supposed glamour of TV. In fact, take my word for it, that archaeological TV is about as unglamorous as you can get – unless your idea of glamour is shivering in ten-inch deep mud and squinting into driving rain while trying animatedly to repeat the same ‘spontaneous’ three-way conversation for the eighth time, before eventually managing to shovel down lunch at 2.30 pm in the relative comfort of a damp and grimy decommissioned double-decker bus (although location catering is generally good, there are definitely easier ways to get a decent meal!). OK, so Time Team did go to the West Indies once, but you should have seen the size of the spiders living in the site. So, whether you are just vaguely thinking that it would be great to go on a dig one day but you do not know how to go about it, or whether you are an experienced excavator looking for a new challenge, this Handbook is the means by which you can immediately start to transform that thought into reality. Just look through the host of possibilities, and start writing. And who knows – maybe you will get on the dig that Time Team is off to next (now let me see, which page is that on?…).